This woolly bear caterpillar is the larval stage of the giant leopard moth. 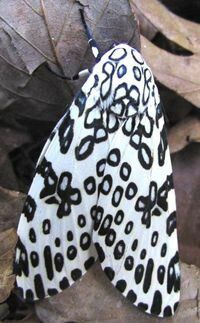 The giant leopard moth (Hypercompe scribonia) is a large species with a wingspan of nearly 3 inches. It has beautiful teardrop-shaped spots on its wings. That is the description I googled to help me identify this species. I found a dead specimen near my wildflower bed but didn’t take a photo. (I ripped off the above photos from google images.) It probably died after depositing fertilized eggs on 1 of the species of flowers growing in my garden. Their larva are known as woolly bears (as are the larva of many other species of moths), and they feed on a wide variety of plants including but not restricted to violets, mustards, basil, trumpet vines, sunflowers, mulberry, magnolia, and locust. Red paper wasps (Polistes sp.) nesting between my screen door and side door. It’s a door we never use, so I let them stay there. Though manmade, it mimics a hollow tree stump or log in scarce supply in modern young forests. A nest of red paper wasps (Polistes sp.) lives in the space between my side door and screened-in door. There’s a hole in the screen, allowing access to this sheltered area. Before humans built structures, paper wasps built their nests in hollow tree trunks, but there are few den trees in the young 2nd growth forests surrounding modern day suburbia. I’m letting the wasps live in the doorway because: a) we never use the side door, b) they are not aggressive, unless defending their nest, and c) they are beneficial predators, destroying the kinds of caterpillars that like to eat their way through my garden. 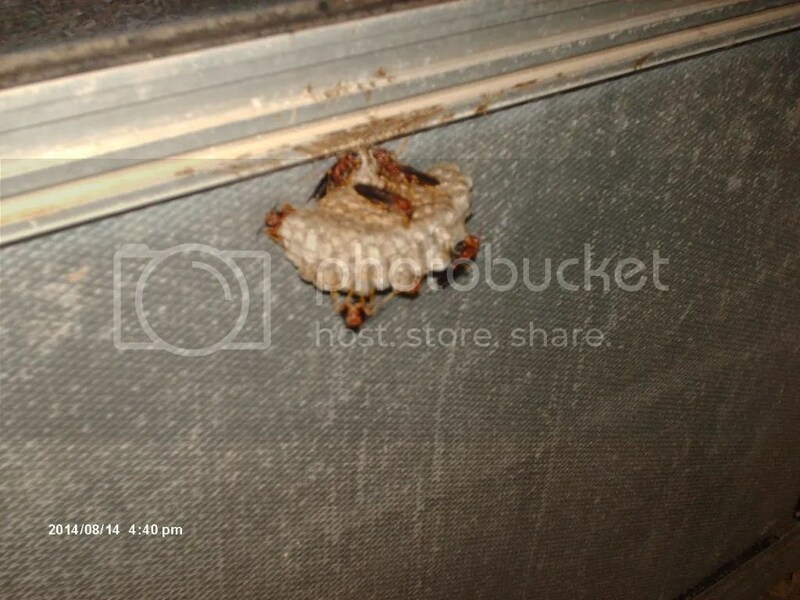 Each cell of the wasp’s nest contains a wasp larva with a paralyzed caterpillar upon which it feeds. There are 28 species of wasps in the Polistes genus that live in the southeast, and I’m not enough of an expert to identify the exact species to which my housemates belong. I admire these little monsters–they invented paper millions of years before the 1st humans evolved.